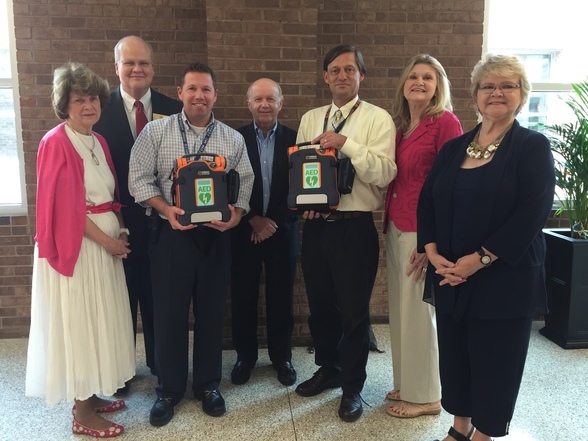 Dunwoody News: AEDs Donated to DHS & PCMS, Nature Center Classes, Food Trucks & more! The Dunwoody Woman’s Club, with the help of Dunwoody City Councilman Terry Nall and the Lord Wedgwood Charity, presented Dunwoody High School and Peachtree Charter Middle School with new Automated External Defibrillators (AEDs). The Dunwoody Woman's Club assisted the city in acquiring AEDs for police patrol cars and donated funds to the city for the purchase of an AED device for the North DeKalb Cultural Arts Center. At least five lives have been saved due to access to these AEDs. Pictured above are (L to R): Jan Slater, Co-Chair Public Issues Dunwoody Woman’s Club; Terry Nall, Dunwoody City Council; Thomas McFerrin, Principal Dunwoody High School; Floyd Larkin, consultant to Lord Wedgwood Charity; Scott Heptinstall, Principal Peachtree Charter Middle School; Sherry Murphy, President Dunwoody Woman’s Club; Maria Barnhart, Co-Chair, Public Issues Dunwoody Woman’s Club. The Dunwoody Nature Center opened registration for fall classes and is conducting a free homeschool open house for any homeschool families on September 2. All homeschooling families in the area are welcome to learn more about the educational programs and resources the Dunwoody Nature Center offers. There is no charge for the event but pre-register by calling the program office at (770) 394-3322. FALL CLASSES: Looking to join in with your friends and enjoy the nature based classes and activities taking place at the Dunwoody Nature Center? Registration is now open for all age classes from 18 months through elementary aged children. It's Food Truck Thursday (#FTTBrookRun)! Come out to Brook Run Park and join in on this fan favorite foodie Thursday event. Give your kitchen (and your cooks) a night off and come out to enjoy some great food truck cuisine. This foodie event has something for everyone with live music, fun giveaways and interactive activities. Food Truck Thursday begins at 5 p.m., lasts till dark and features different unique culinary options each week. Olde Village Court, Olde Village Lane, and Olde Village Run - anticipated completion by the end of next week. Independence Square - anticipated completion by this weekend. 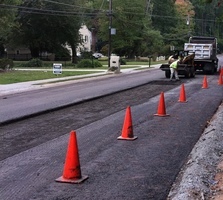 Select streets within the Branches neighborhood - work begins next week. Dunwoody invites you to get involved in creating a lasting impression on the city by helping to name the city’s newest park at Pernoshal Court. The “Name Your Park” contest offers participants a chance to choose a favorite new park name from a list of five potential selections or provide a write-in idea for a potential park name. Interested residents can participate in the contest by registering at the “Name Your Park” online contest portal at www.connectdunwoody.com. This event is made possible through the hard work of Dunwoody Girl Scout Ambassador Mandy Gillis along with generous support from Dunwoody Baptist Church. The Health Fair, part of Mandy's Girl Scout Gold Award project, takes place on September 12th from 9am-12pm in Dunwoody Baptist Church’s gym. The event is open to the public and attendees can visit more than 20 vendor tables offering a variety of health-related information, visuals, free samples and instructional advice. Doors open at 9am and attendees are asked to donate a minimum of $1 for entry. For additional information please visit the The Dunwoody Health Fair Facebook site. Questions for the City of Dunwoody?